How can you DO this? I don't see this option under My Accounts, or do I need for it to come out of test first? "when this feature will be publicly available." So it's not available as we can see. Is this the same as Universal Login for Google Apps Standard Edition/Business? I think that feature is also on old? Using an Google Apps Standard Edition/Business account for adwords, Reader, Youtube, Blogger, etc? or am I confusing things? Hm. I'm not sure whether this would be better or worse than passing information to the primary account through the usual channels. (Forwarding in Gmail, sharing in Docs/Cal, exporting OPML in Reader.) I've spent a lot of time consolidating all my stuff into one Google account, and I don't regret that. But I also have to admit that, if this feature had been available several months ago, it's possible none of that would have happened. > account through the usual channels. I doubt very many people would WANT join their accounts together. The whole point of having more than one account is to keep stuff separate. I don't want the accounts cross-polluting each other - I just want to be able to sign in to my 'work' account for google analytics, but my 'personal' account for buying things in Google Checkout or looking at my iGoogle page. Currently I have to keep signing in and out all the time which is *really* annoying. Glad they're fixing this. @NickG: Fair enough. I use my secondary accounts almost exclusively for email: I have a professional address with my name on it, a spam address for registering on questionable site, and a mandatory college address. Given that, it's a tremendous help to have a consolidated inbox. I don't think I'd have a problem using the same primary account for both personal (Checkout) and professional (Analytics) tasks. I don't really draw a distinction between the two, and security-wise, I'm still fairly trusting of Google. But I know some people really prefer compartmentalization, so to each his own. I've been signing into different Google accounts (personal and domain) in different browser tabs for years, in both Firefox and Chrome. It's only in the last couple of weeks that I've started to have problems. It says, "Multiple sign-in will let you open Gmail in multiple tabs, log in using different accounts and read the messages from all your accounts without opening another browser. Right now, you have to log out before logging in to a different account." Currently, if I login with my account on one Chrome, Firefox, or IE tab and then open another tab, it retains my credentials. So I can open iGoogle home page in one tab and then if I open a new tab and navigate to Gmail page it will use the same account. What will happen if I signed in for more than one account on a first Chrome tab and then open a second tab and navigate to Gmail? Which Gmail account will a second tab use? Although I have multiple accounts just for the purpose of keeping my work and personal items separate, not being able to log into multiple accounts in Google Talk (not on the list of multiples in this article) has forced me to add work contacts to my personal contacts list so that I can interact with them via Google Talk as my personal account is the one linked to GT. If I could have the option of linking both accounts in Google Talk, I'd love it. I'd prefer a client based approach to multiple accounts like Mailplane, only for calendar and docs and maps. I have more than 4 profiles . All I want is for them to merge my freakin' accounts. Seriously, I don't want a GMail account. I have Google Apps, let me use that account as my primary and only Google Account. The fact that I have to have a separate account in the first place is the stupidity here. This has been the case for me for a while now. I have not enabled anything but noticed a few months back that I don't have to log back into reader after checking my google apps mail. 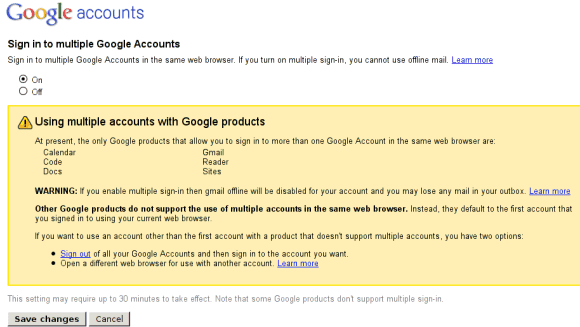 Would be nice to officially link the 2 accounts in my google account settings though. Gah. Don't tell us about it until we can try it. This is like telling us the old man is giving out free candy, but not telling us WHICH old man. Currently I use Firefox + Multifox extension. Everything works fine! Google shows a drop down arrow next to your email address and it list all the accounts you're logged into, the default account and an option to sign into more accounts. The Opera browser, with its built-in email client, lets you set up unlimited POP accounts. What would be awesome is if the current activated account is shown at the top as usual (in email form)... with a little drop-down arrow. In theory, you'd already be "authenticated" for each of the different accounts, but only one would be activated at a time. Then, you just choose the drop-down at the top and switch to one of the other accounts a viola. Have no idea if this is how this is intended to work, but it would be awesome if this were the plan. I was able to sign in to two different gmail accounts - one vanilla gmail and one for a domain - in two different tabs. Used to work like a charm. Not anymore. So to me this is like removing a feature, not adding one. Aren't this info under NDA? You've received it under Trusted Tester Program and Google doesn't announced this feature anywhere else. Does anyone know what the root cause of the issue that bring this to light in the last couple of weeks. As a Google Apps Reseller, it is concerning that I cannot go to a single place to see the known issue and what is being done to fix the problem. I was on the call this week for the multi-domains, and it seems that this could have caused this problem. Can anyone confirm that? If this allows me to change my e-mail address in Reader or Code to something else than my Gmail address, I'm eager to have it available. Google account multi login, a greasemonkey userscript that let you switch between several google apps and google accounts. So, I switched to the beta of Googla apps accounts working more like a Google account, and now I can't sync my browser with my google account because there's a conflict with both accounts. I also can't access reader without conflicts, and when I go to gmail to check buzz, well, it's not possible unless I sign out of my google apps account and unsync my chrome browser. I also have issues with sharing stuff in reader, because when I go to google.com/reader it redirects me to a 'new' reader account linked to my google apps account, so I have two now, and it wouldn't that much of a problem if I could access both on the same browser, but i cant. Please help anybody!! it's a nightmare. How I accessed my google services was like a well greased machine, but now that's all gone. Help! Chrome should really just support multiple unique sessions (other than incognito; per tab). Since I turned this feature on, I have to log into each google service each time I go there...mail, reader etc.?? And I thought I will be able to have in my accounts settings a place where I can merge all acounts to one, having them both in one box when I combine, and when I login from one the other's data isn't available in this session anymore etc. Can't wait for that functionnality ! this thread is funny. one guy says "gah, don't torture me with this info before i can lay my eager paws on it!" another guy says "i wouldn't want it, they shouldn't waste their time!" i for one am very glad to hear it's coming. i hope it's a simple drop-down at the top of any page, where i can pick my profile, and then reload the current page as that profile. the history of the tab should flip-flop between acounts, as i go back in time, so i can easily, for example, copy something from one account to another. Welcome new feature, I was waiting for you! Blogger. Please allow me to have two instances of Blogger open at once, under two different accounts. I'm going crazy signing in and out of each account all the time. When they will merge Google Apps and Google Account, waiting years for that.. Sometime, I can do login multiple accounts on same browser. Usually adsense + gmail. Another post without a mention of how to take advantage of this ... Jeopardy music ensues. g8 now i can use as many accounts in google..but i use to login from my gtalk into many accounts before 2! this is a much needed feature. currently i have to use firefox and chrome for different google accounts. would prefer to stick to just one browser. I don't understand why so many people are using non-Firefox browsers to solve this problem. It's really easy to create multiple Firefox profiles, and run them simultaneously using the -no-remote argument. That way you can stay almost permanently logged into each account. To identify the different profiles at a glance use Titlebar Tweaks. To sync your bookmarks across profiles, use Xmarks. Mine works fine, but I would rather have a Thunderbird look alike so we can see multiple accounts in one page. Google should develop a Thunderbird clone in the cloud.